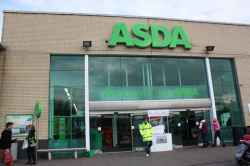 Asda supermarket chain sells food, clothing, toys, financial services and general merchandise from its numerous outlets around the UK. Based in Beehive Centre, Coldhams Lane, Asda is a supermarket. Asda is in Beehive Centre Coldhams Lane. You can view a list of neighbouring businesses by going to the Beehive Centre page. Note: the pin is positioned at the postcode centre, and may not correspond with the precise location of Unit 9, Beehive Centre, Coldhams Lane.